Improving fuel economy of road vehicles is an important objective for countries around the world. Even major oil exporters would benefit economically from consuming less of the oil they produce. For those countries that rely on oil imports to meet their transport fuel demand, energy security is an important priority. If action to mitigate climate change is not politically popular, as in the United States, policies aimed at improving fuel economy appeal to broad constituencies and can be used to achieve both objectives of mitigating greenhouse gas emissions and reducing the need for oil imports. As the graph above shows, the fuel economy of vehicles in the United States plateaued between 1985 and 2005. The Corporate Average Fuel Economy (CAFE) standards that were passed in 1975 were successful in doubling the efficiency of cars by 1985. Once the goal was met, and oil prices stabilized after the steep price shock that motivated adopting CAFE standards, improvements in fuel economy stagnated. As oil prices reach new highs, and demand for oil in emerging economies grows, the pressure to improve fuel economy is building once again. Fuel economy has improved dramatically since the first set of CAFE standards went into effect. Currently, the new iteration of CAFE standards should lead to 39 mpg passenger cars and 30 mpg light trucks by 2016. This is being accomplished by improving tire rolling resistance, better aerodynamics, reducing vehicle weight, and using redesigned transmissions powered by smaller engines. In addition, hybrid and electric vehicles will be an important contributor to energy security. More in-depth information about transport technology improvements is available in the Transport Sector report. The impact of these vehicle improvements is encouraging. As the above figure shows, carbon dioxide emissions per km driven have decreased sharply since 2000. 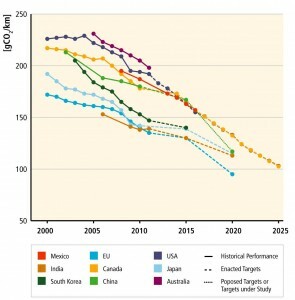 Vehicle emissions are converging to around 100 gCO2 per km between 2020 and 2025. This assumes implementation of existing policies and continuation of fuel economy improvement efforts. It is crucial that, as developing countries add vehicles to their roads, this trend of sharp reductions in per km CO2 emissions continues. A de-facto global standard for vehicle CO2 emissions, driven by fuel economy regulations in the largest vehicle markets, would do a great deal to mitigate greenhouse gas emissions. Energy security and global climate change are two of the most important issues countries find themselves confronted with. By adopting strategies to the improve fuel economy of vehicles, thereby reducing their CO2 emissions and fuel consumption, both issues can be addressed. Policymakers should be congratulated for the work they have done so far, but much room for improvement remains. Still, more ambitious targets must be set to make serious inroads in transport sector greenhouse gas mitigation.